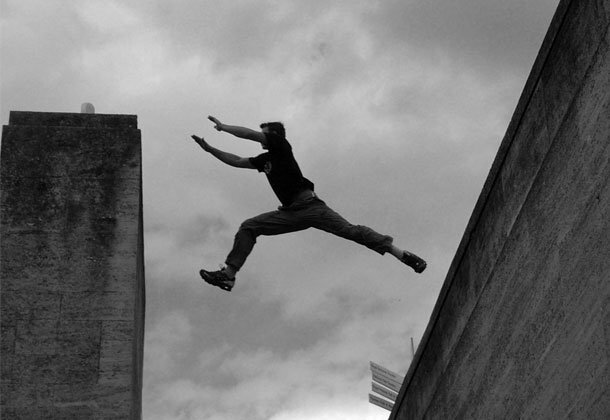 Fearless Parkour is a system grounded in flight fundamentals. Flight Fundamentals include all of the basic movements needed in a chase or escape scenario. Flight training is a commonly overlooked aspect of self-defense and Mixed Martial Arts training. Fearless Fighting takes a more traditional approach to Parkour, the efficancy in moving from point A to point B. Our philosophy is to make simple movements complex in order for the complex to become simple. Through repetition and focus the classes will emphasize on balance, coordination, and agility. Our sessions will be held both indoors and outdoors and will include such techniques as: precision jumps and landings, vaulting, and wall training. The original French term for Parkour is “Art Du Displacemeat” or “the art of displacement”. It is important to find your own path down this road that is Parkour. This desire is the reason many true practitioners are referred to as “Tracours” or ones who trace paths. Our primary goal is to help our students develop a vision and an overall mobility through his/her own environment. Everyone has a spirit that can be refined, a body that can be trained in the same manner, a suitable path to follow.”- Morihei Ueshiba. Athletic conditioning is one of the long term benefits of the Parkour program as well as “falling” correctly.One of the greatest assets Hollywood stuntman have is the understanding of how to fall correctly preventing injury. Imagine your self falling down a flight of stairs, and getting up to walk away unscathed.